Boost proudly introduces an innovative design that will shake you up! Hells Fury is intended exclusively for herb lovers. Made of a high quality borosilicate glass, it features a bouncer base tube ending up in a comfortable mouthpiece through a twisted line offering you a comfortable grip. You place your herbs onto the bowl coming with a handle for easily lifting it up.The bowl connects to a detachable chillum used to spread your smoke into the tube so as to get filtered by the water. 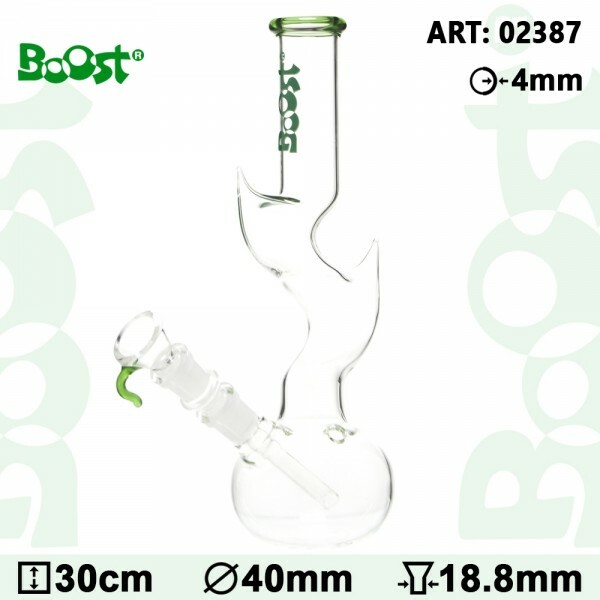 A kick hole on the bouncer base will offer you an alternative toke angle.The green Boost logo features at the top of the tube.